MAYOR AND DEPUTY MAYOR PATROL WITH RUGBY STREET PASTORS. 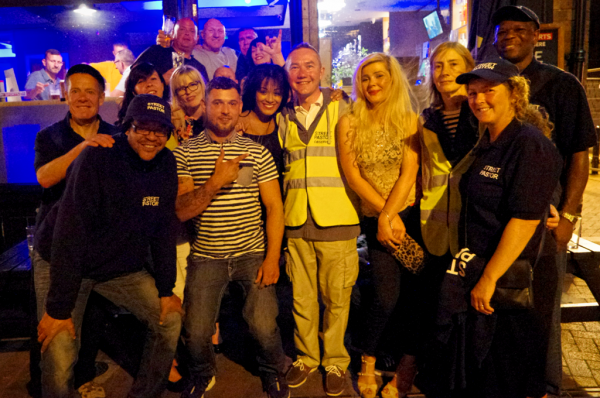 Rugby’s Mayor, Councillor Richard Dodd and Deputy Mayor, Councillor Sally Bragg, (Yellow Jackets), pictured with the Rugby Street Pastors and Clubbers. On Saturday 22nd August, Rugby’s Mayor, Councillor Richard Dodd and Deputy Mayor Councillor Sally Bragg, went out on patrol with the Rugby Street Pastors. While on patrol, they experienced first-hand the Rugby night time economy, including visiting night clubs and talking to the door staff and clubbers as they patrolled Rugby’s streets. Pete Hickey, Rugby Street Pastor Coordinator, said “I would like to thank the Mayor and Deputy Mayor for their comments and for giving up their time (and sleep!) and the interest that they have shown in our work by patrolling with us. *This was subsequently published in the local Rugby Advertiser and Rugby Observer newspapers.